Find hotel near Tirumala Tirupathi Devast ..
One of the nation’s most celebrated temples, Thirumalai Thirupathi Devasthanam is devoted to Lord Balaji. Lord Balaji or Venkateswara is an incarnation of Vishnu. The name Venkateswara is derived from two words Venkat which is a hill in the South India and also means “destroyer of sins” along with eswara that means Lord. You can perform various sevas or services here, along with different kinds of aratis. The whole experience is as satisfying a visit to the Tirupati temple in Chittoor district. The morning aratis especially are really blissful. In case you do get a chance to visit in the morning, nothing like it. Also, visit the popular attractions in the city by following Chennai itinerary 1 day. You can make online booking 60 days in advance. There is accommodation available too, which must be booked in advance. Arjitha sevas or artis may be surcharged. 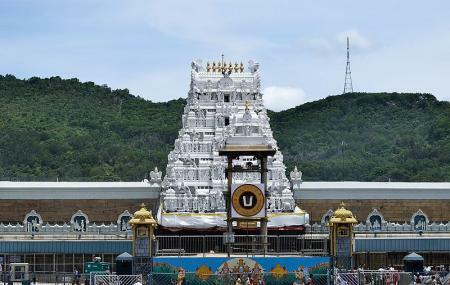 How popular is Tirumala Tirupathi Devasthanam? People normally club together Express Avenue and The Anna Centenary Library while planning their visit to Tirumala Tirupathi Devasthanam. Beautiful temple. Located on the main road. Convenient for old age people to go. But there should be a separate Que or facility for senior citizens to have quick darshan. Heavenly place. Replica of original tirupati temple. Go for it if you need mental peace and blessings. Most awesome place in the country. Divine and clean. Mind soothing place on Earth. Visited lord's place for his blessings. A very powerful temple of lord Vishnu. Divine temple. Must visit for all.